If there was only one item to get us through the long summer days, it would be Sidewalk Chalk for the win. Not only is it super inexpensive, but it’s great for all ages and has unlimited play potential. And really, what’s better than a “messy” activity with NO clean‐up?! 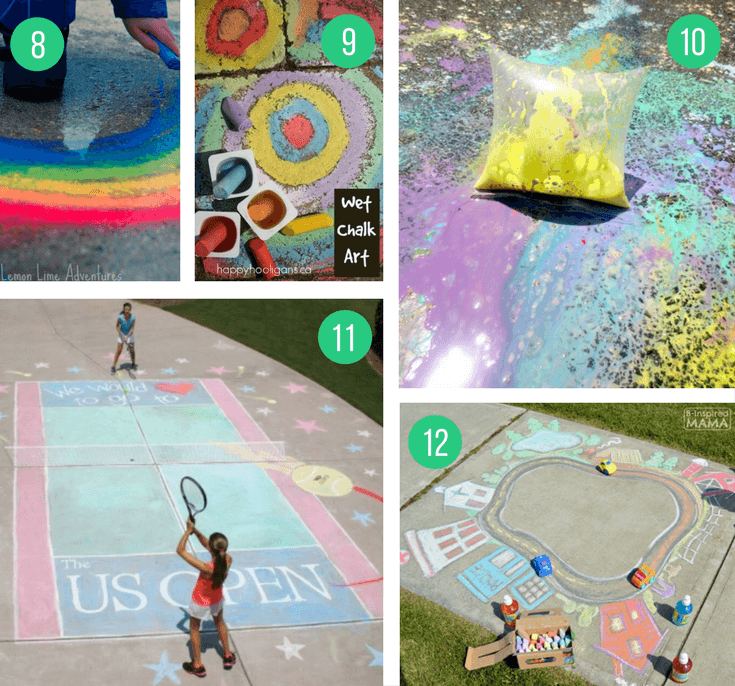 We’ve pulled together our favorite sidewalk chalk ideas into an epic list of learning activities, games, imagination spark‐ers, and get‐them‐active ideas that will keep your chalk repertoire fresh all summer long. Plus some totally cool interactive chalk art you don’t want to miss! 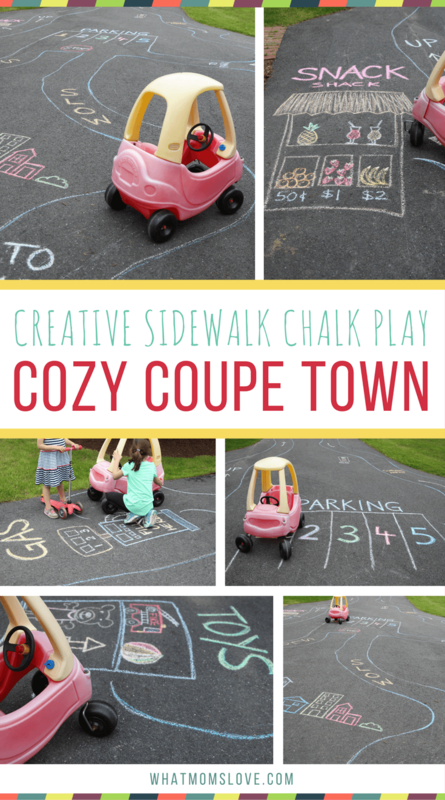 So grab your box of chalk and head outside with your kids for hours of nonstop fun! Please note: this post may contain affiliate links. To find out more, please see our disclosure policy. There’s nothing that makes our kids run away faster than pulling out some oversized workbooks over summer break. 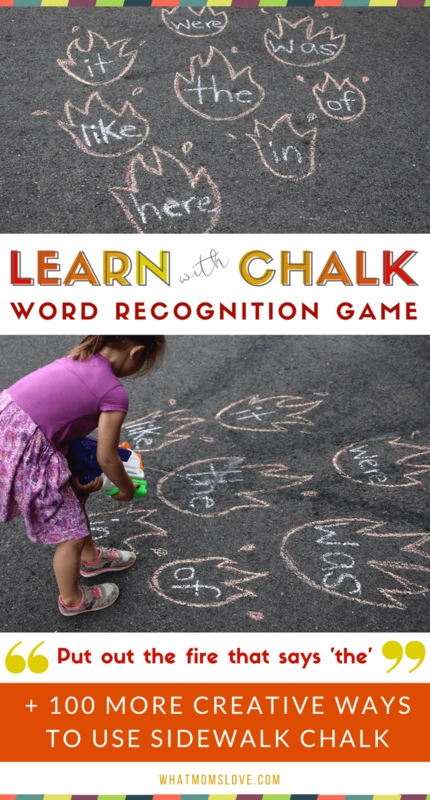 We get it, the Summer Slide is a real thing, but instead of trying to get them to hunker down inside to “learn”, try engaging them with these clever educational activities that all use, yep, you guessed it – chalk! Your kids will be having so much fun, they won’t even realize they’re learning. If you’re looking to boost your child’s knowledge of everything reading‐related – whether that be letters, sounds, spelling or sight words, these chalk‐based activities will have them perfecting their ABCs and at-in-me’s in no time. 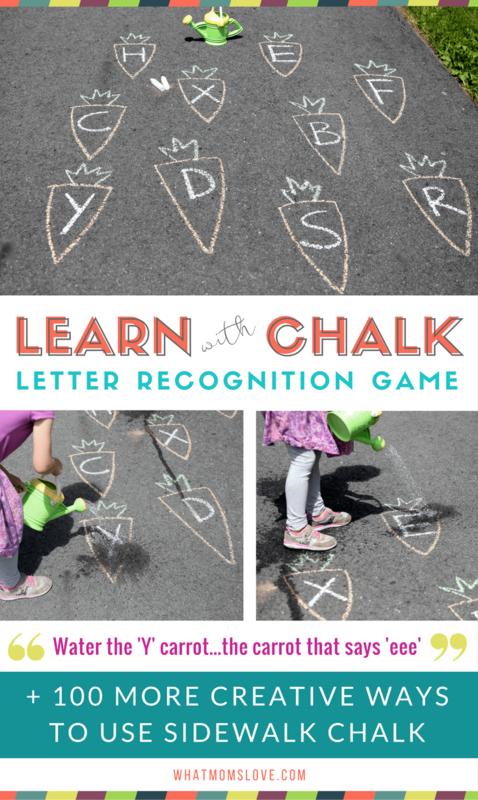 (1) Rainbow Chalk Tracing: This is a classic way to help your child learn how to write letters and words. First, take a piece of white chalk and write whatever you’d like your child to practice – it can range from upper and lowercase letters to sight words, numbers and their name. Then have them trace it with a few different colors of chalk. As they add more and more colors, they’ll see a rainbow forming. (2) Sidewalk Paint Word Tracing Game: Alternatively, have your kids use sidewalk paint (tutorial for a DIY version at Mess For Less or buy our favorite Crayola version here) to paint over the letters. Such a fun and engaging way to get in that repetition practice. (3) Water Word Painting: If you’re worried about the potential mess from the sidewalk paint for your littlest tikes – try this genius idea inspired from Toddler Approved: simply take a paintbrush and water to paint over the chalk instead. (4) Rock Letters: Write large letters and have your kids use rocks (or try leaves, grass or whatever your kids can find!) to “trace” them (via And Next Comes L). 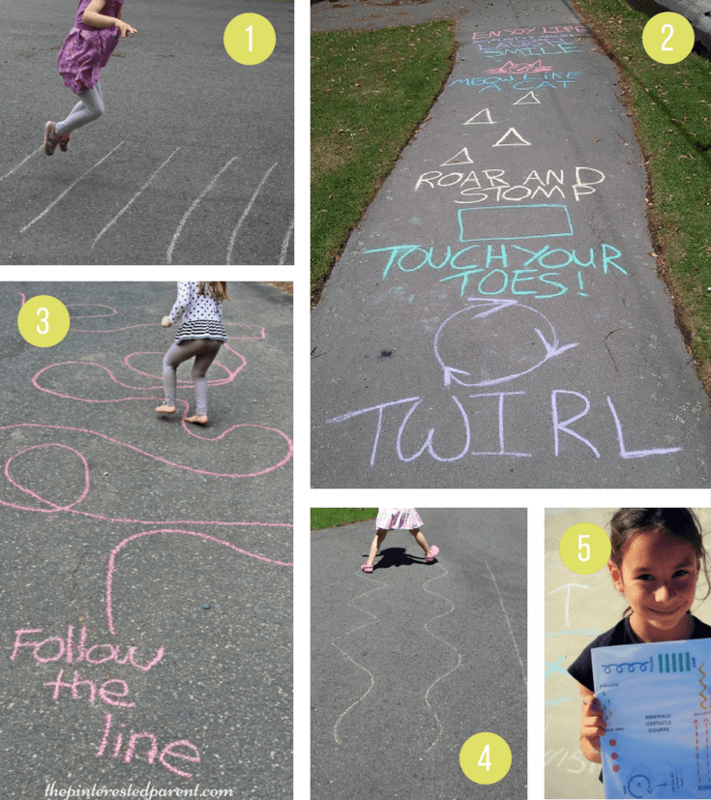 (5) Chalk Stencil Letter Practice: Take your stencils outside (these ones work really well) and have your kids stencil their names, words or just the individual letters using chalk (pic via How To Run a Home Daycare). (6) Letter Sound Hide and Seek: Animals, Hide ‘n’ Seek and chalk – this game from The Letters of Literacy has it all and teaches kids to use letter sounds to determine where to place each animal. Super fun! (7) Sidewalk Word Families Ladder: Encourage reading and movement using these genius word family ladders from 123 Homeschool 4 Me. (8) Alphabet Grid: With this simple alphabet grid from Buggy and Buddy you can play a whole variety of interactive learning games. 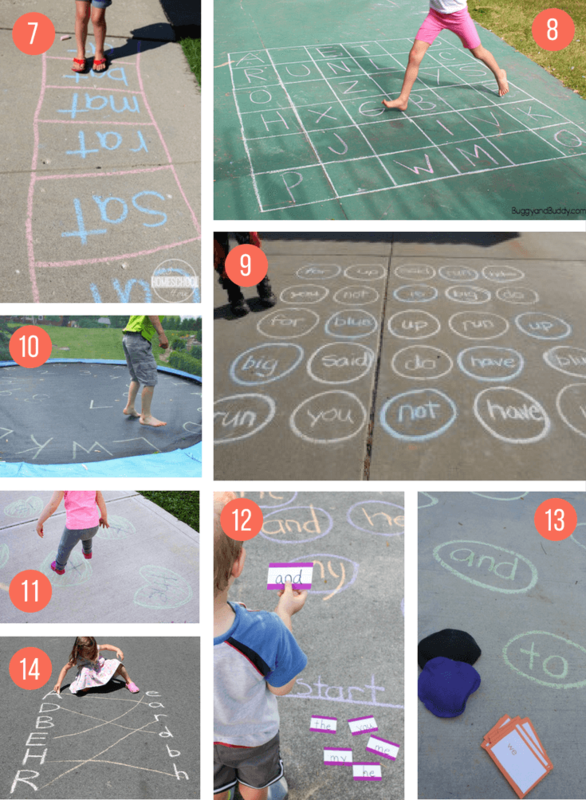 (10) Letter Learning Trampoline Games: If you have a trampoline, take the chalk for a bounce and write the alphabet on it (don’t worry, it’ll wash off with the next rain). Then use these super engaging games from Hands On As We Grow to start the learning fun. (12) Finding Sight Words: Use cards and race against the clock like this sight word game from The Educators’ Spin On It. (13) Sight Words Bean Bag Toss: Write words (or letters) and then call them out – see if your kids can land a bean bag on the right word (via A Mom With A Lesson Plan). (14) Upper & Lowercase Letter Match Up: Great for learning uppercase and lowercase letters – write a series of letters and then have your child draw a line between the matching pairs. Carrot Patch Letter Spray: Write the letters you’d like your child to practice and draw a cute carrot around each one. Then arm your child with a watering can or spray bottle and give them instructions like “water the carrot that makes an ‘ahhh’ sound” or “get the carrot wet that has a ‘P’ on it”. Put Out The Fire Word Spray: For a slightly different version, (perfect if you have a firetruck lover! ), put letters or words in flames, give your child a squirt gun or hose, and call out the instructions. Kids love this one! Get your kids number savvy this summer with these inventive games that will teach them everything from number recognition to counting and math. (1) Number Dice Match Up: Write numbers 1–6 in one column, and draw the 6 dice faces in another. Then task your kids to match each number with the corresponding die. 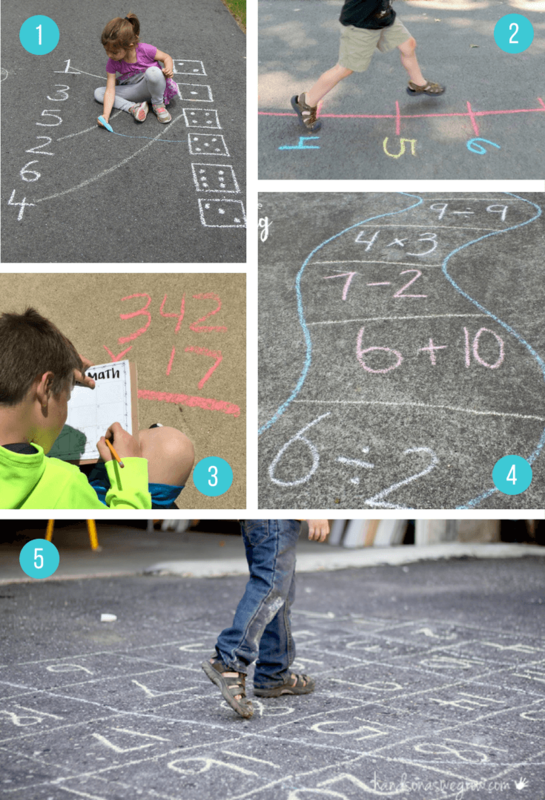 (2) Number Line Learning: Brush up on their counting and math with these fun games from Childhood Beckons, all involving a large scale chalk number line. (3) Sidewalk Scoot: We love this game for slightly older kids inspired by The Primary Gal. Write various math equations on each sidewalk square – have them “scoot” along and write the answers on a piece of paper and then return to the start for the “judge” (you!) to check their work. If they have an answer incorrect, send them back to the beginning to go through the problems again until they find their mistake! (5) Counting Maze: This is a super smart way for kids to learn number recognition and counting from Hands On As We Grow. Scale the numbers for your child’s age and level (use 1–20 for younger kids; 20+ for older). We’re not done with learning yet! How about even more engaging chalk activities that will help your young’uns learn their colors and shapes, and your big kids to explore anatomy and astronomy – far out! (1) Chalk Treasure Hunt: Write instructions for what your kids need to find including numbers, colors and other descriptive words (big/small, fat/thin, etc) then send them off on a fun adventure! (via Nurture Store). (2) Nature Color Hunt: For younger kids, keep it simple and have them go hunting to find items that match your chalk colors. (3) Shape Maze: This clever maze of shapes can be used for a number of interactive games that will have your kids discriminating a rectangle from a square in no time (via Creative Family Fun). (4) Anatomy Lesson: Trace your child’s outline and then fill in the organs (this handy printout will help!) 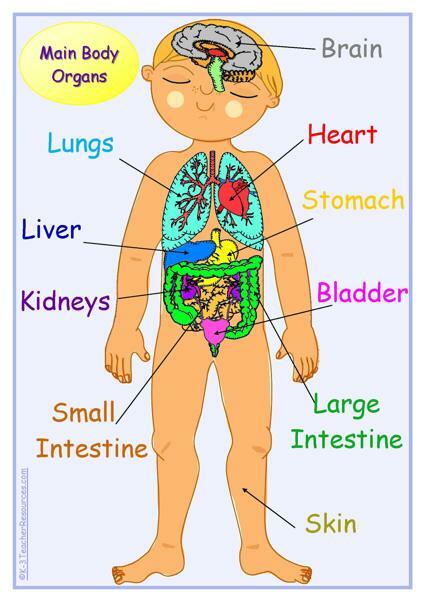 – a real life‐sized anatomy lesson (via True Aim Education). (5) Anatomy Word Match: Alternatively, list body parts besides the outline and have your child draw a line between the word and where the part is located on the body. (6) Constellation Art: Introduce your kids to astronomy by creating replicas of constellations with rocks and chalk! (via Creekside Learning). (7) Sidewalk Simon: Take the classic handheld game to the streets. This version from Toddler Approved is great for learning colors, enhancing memory, and for being active (it requires a lot of jumping!). 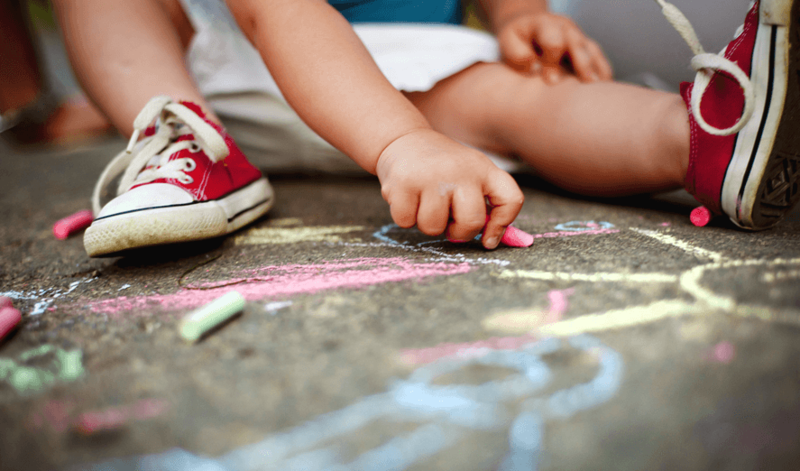 Fostering your child’s imagination is just as important as teaching them their ABC’s, and these fun chalk activities are sure to get their creative juices flowing. (1) Playing with Shadows: If you’ve got a nice sunny day, take full advantage of it and get creative with these shadow games. First have your kids draw faces on each other’s shadow (via A Little Learning For Two) – a great way to discuss emotions while having a good laugh! (2) Next, trace the shadow (they’ll love to make funny poses) and color it in – we love this Shadow Art from Rhythms of Play which uses chalk paint to make beautiful works of art. (3) Dolly Dress Up: Trace their body and then have your child draw on clothes and accessories. (4) Nature Mandala: Make a colorful mandala using natural items from around your yard – just look at the stunning outcome from Nurture Stone! (5) Grid Drawings: We love this classic art activity taken to the next level. 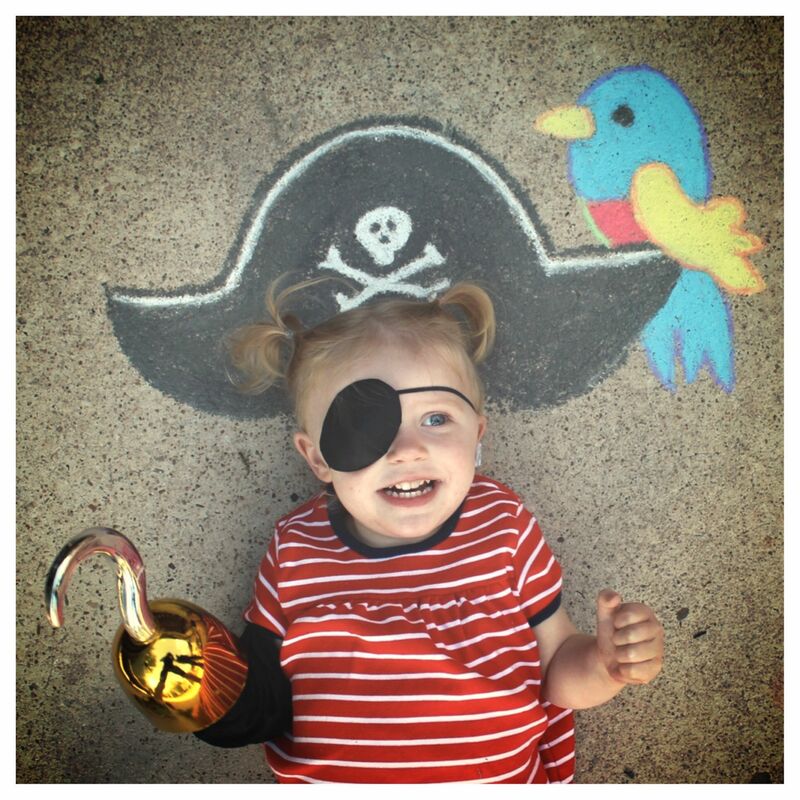 Take a photo or print out of your child’s favorite characters and draw a grid over it. Make a large scale grid on your driveway with chalk and then have your kids copy what’s in each square until the drawing is complete. (inspired by The Educators’ Spin On It). (6) Chalk Resist Art: Grab some painters tape and have your kids tape out a pattern on the driveway – add chalk over it and then remove the tape for a cool resist effect like these from You Clever Monkey. (7) Drive Thru Maze: Make a fun life‐sized maze and navigate cars (or just yourself) through from start to finish (via Hands On As We Grow). (8) Puddle Art: Rainy day? Throw on your raincoat and boots, find some puddles and make gorgeous watercolor‐like art works like these from Lemon Lime Adventures. 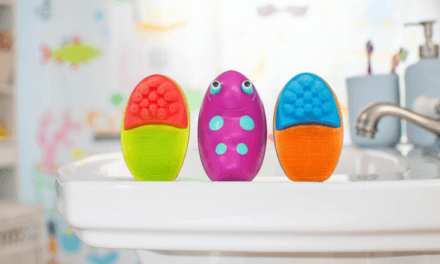 And if you’re up for a little extra mess – let them splash through the colorful puddles after they’re done! (9) Chalk Dippers: Add a major punch of color to your creations by simply dipping the chalk in water (via Happy Hooligans). (11) Sports Court: Make a pretend court for tennis, volleyball or basketball, then get out the rackets and balls for a real match! (pic source unknown). (12) Town & Roadway: Get artistic and draw a whole town and road system for your kid’s matchbox cars like this incredible example from B‐inspired Mama. Add a parking lot and construction site (with real rocks!) to up the playability even more. Cozy Coupe Town: Now if you really want to amp it up a notch, take your Matchbox car town and super size it to become big enough for a Cozy Coupe. We used this ingenious tool featured in our Non‐Toy Gift Guide to draw the roads (without breaking our back!) and included fun pit stops like a gas station, snack shack, toy store and parking lot. Your kids will have a ball puttering around and using their imagination at each stop. Want your kids to blow off a little steam outside (hello, nap time guarantee!)? These activities will get their bodies moving, muscles engaging and hearts pumping. (1) Long Jump: Draw a series of horizontal lines and challenge your kids to jump as far as they can, marking where they land. Then see if they can beat their farthest jump. Add variations like a running start, jumping backwards or on one foot to keep the fun going. (2) Follow Me: Use active instructions for your kids to follow while navigating a custom course – we love this example from Matty Angel. (4) Line Stretch: Try drawing 2 lines and have them keep their feet on both…make the lines zig and zag so they have to stretch! Again our Walkie Chalkie came in mighty handy for this one. Don’t Step In The Hot Lava! : Test your child’s coordination and balance by creating stepping stones across your driveaway. Challenge them to reach the safety base by hopping from one to the next without falling into the “hot lava”! Bike/Scooter Course: Using our handy dandy Walkie Chalkie, we expanded on our Cozy Coupe town and drew a system of roads from one end of the driveway to the other, inviting kids to use their own form of transportation to get around the “town”. We used plenty of twists and turns to make it more engaging, plus fun elements like traffic lights, stores and speed limits. This one gets their blood flowing, and their imagination soaring all at once! 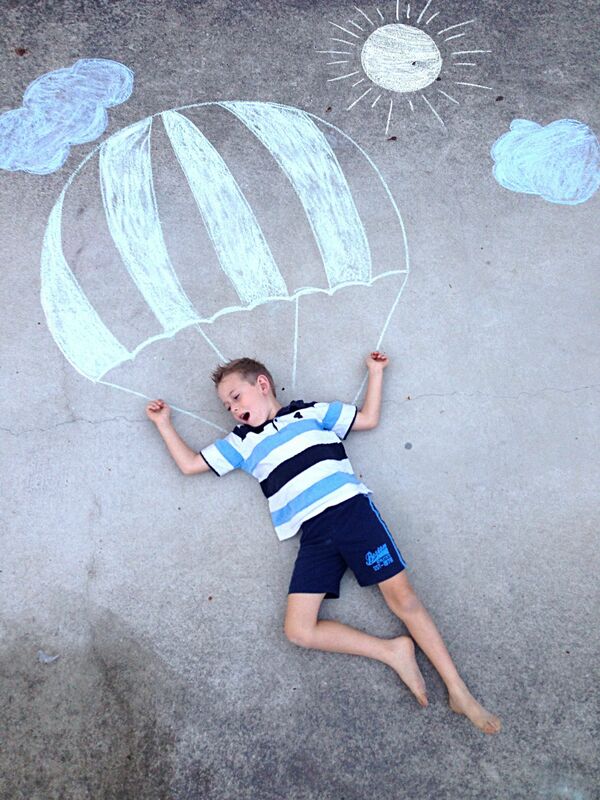 Breathe new life into some classic games by taking them outside and supersizing them with chalk! (1) Sidewalk Checkers: Create a larger‐than‐life checker board with paper plate pieces like this one from Crayola. (2) Hangman: A tried and true game that feels new again in this larger format (pic via Inner Child Fun). (3) Memory: In this version, arrange an even number of paper plates on your driveway, then write pairs of letters or numbers underneath them. Have you kids take turns flipping over 2 plates at a time to try and find a match. (4) Dots and Boxes: We love this great 2+ player game where you take turns connecting dots to try and create the most boxes (pic via Make and Takes). (5) Target Practice: Draw a series of targets and give them various point values based on the size and distance from the start (the further away and smaller the target, the more points). Have your kids toss bean bags and tally up their points (math practice!). This would also be super fun on a hot day using water balloons like our favorite Bunch O’ Balloons. (6) Race Car Targets: Using the same targets as above, race any sort of vehicle from the start line to try and land on them to rack up points. (7) Trampoline Twister: Make a game of Twister even more tricky by drawing a life‐sized game board on your trampoline like Family Days Tried and Tested (or if you don’t have one, use your driveway instead). (8) Pictionary: Grab your Pictionary game and use some asphalt as your sketch pad! (9) Putting Range: Create a super fun mini golf course like these from Crayola with plastic cups or milk cartons as your holes. How fun are these interactive works of art? Show your kids these incredible creations as your inspiration, and then try to replicate them or make up your own. They get a great art project, and you get a stellar photo – a win‐win for everyone! 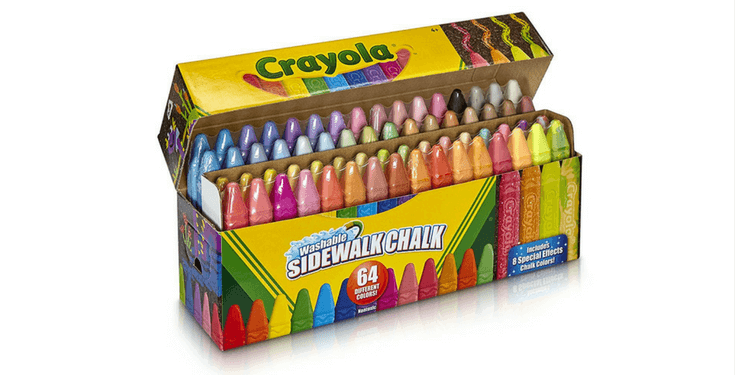 Crayola Ultimate Washable Collection: This set of 64 includes an unbeatable variety of bold and vibrant chalk colors for an incredible value. Walkie Chalkie: This clever chalk‐holding device is a game changer for drawing long lines (think roads and hop scotch!) without bending down and doing the crab crawl. Sidewalk Mandala Stencil: This oversized stencil from Alex Toys can be used to create these stunning mandalas. 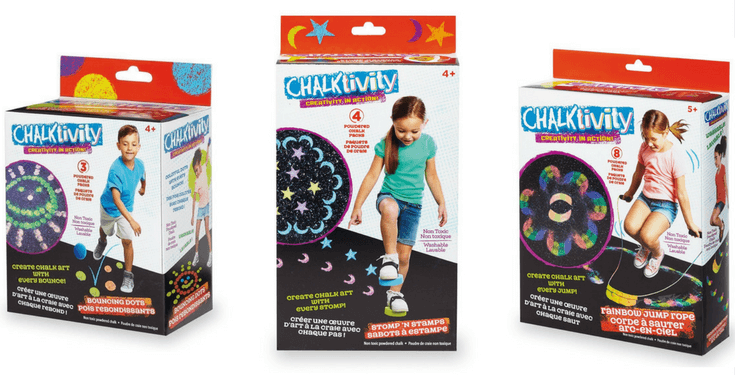 Chalktivity Products: Chalktivity has really upped the game when it comes to chalk play – their Stomper Stamps, Bouncing Chalk Dots and Rainbow Jump Rope all use a special powdered chalk that is non‐toxic and washable, but allows for imaginative new ways to play beyond the chalk stick. 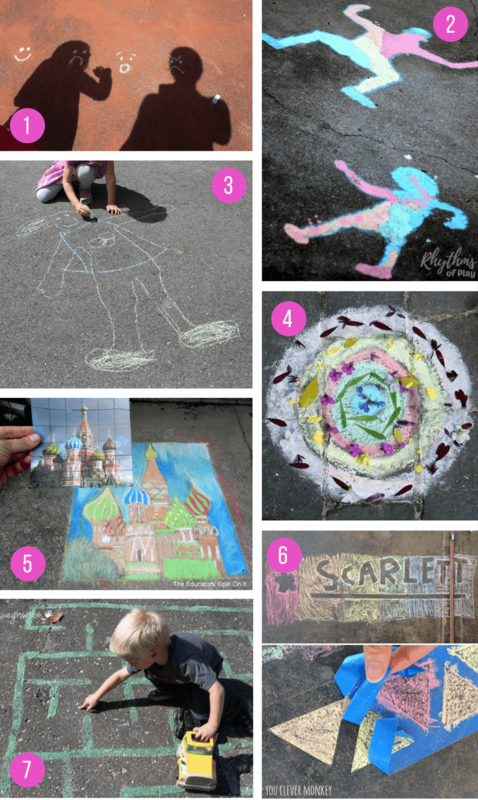 We hope this list of incredible ideas helps open up a new world of possibilities for your chalk play this summer. But before you head outside with chalk in hand, we’d love to have you join our What Moms Love community. We’ll hook you up with all of our exclusive resources including our popular 10 Screen‐Free Toys For Guaranteed Quiet Time (this is seriously a game changer mamas! ), Holiday/Birthday Coupon Book for Kids and 35 Food Subs & Swaps for Healthy Family Meals. Just let us know where to send all your goodies! What activity will be first on your list to try with your kids? 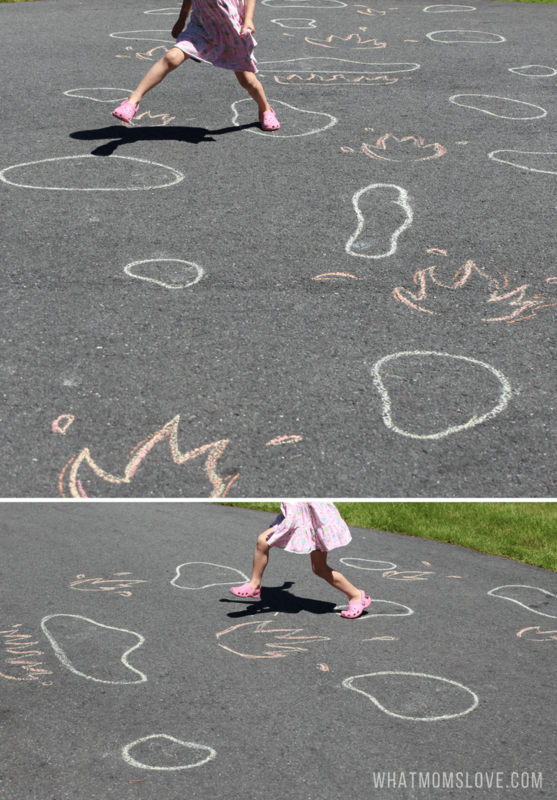 Let us know your favorite chalk games or activities in the comments below — we’d love to hear from you. 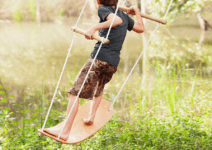 8 Outrageously Cool Swings & Hide‐Outs That Will Keep Your Kids Outside. All. Summer. Long. The Ultimate Family Beach Guide. 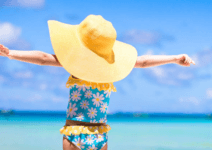 37 Sanity‐Saving Tips & Tricks For An Epic Beach Day With Your Kids. PreviousFree Printable Father’s Day Booklet. A Homemade Gift Sure To Melt Daddy’s Heart. NextWaffles For Dinner?! 3 Insanely Easy (& Delicious!) Recipes Your Whole Family Will Devour. So many fantastic ideas! As a homeschooler, I’m always looking for ways to make learning fun, and this certainly fits the bill. Will be back to this one other this summer, I’m sure! This might be the best post ever!! 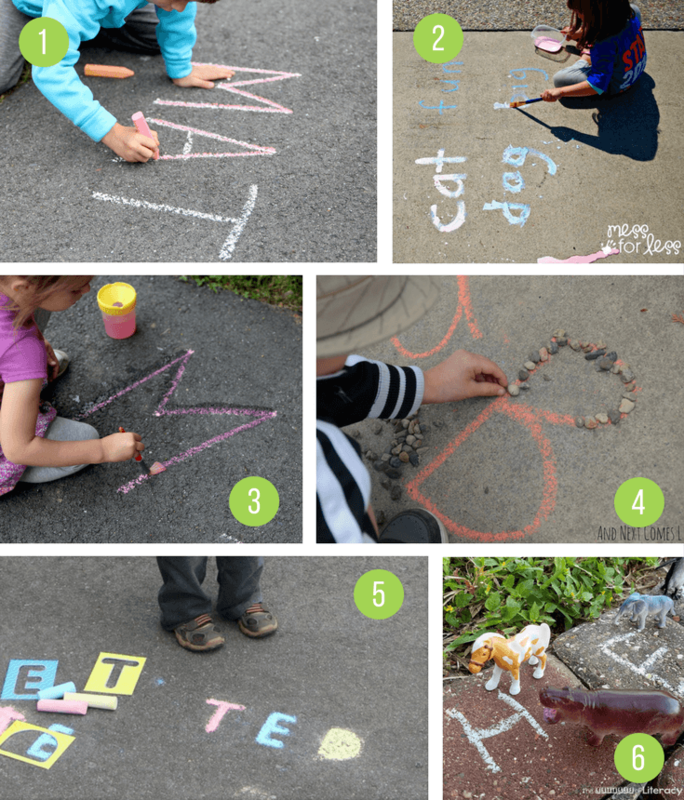 I hadn’t thought of doing letter/learning things with chalk outside. I think my 2 year old would love this!! The walkie chalky thing is also awesome. The worst part of using chalk is getting down on the ground crawling when they want something large drawn, so I’ll have to try this. Thanks for all of the great ideas!! Really great ideas! We will definitely be using some of these this summer! fabulous ideas and a great blog! Oh my gosh these are amazing ideas! I love finding new ways to use sidewalk chalk. These are amazing ideas. Totally pinned it. Such creative ideas! I like the race track!! This is so awesome! 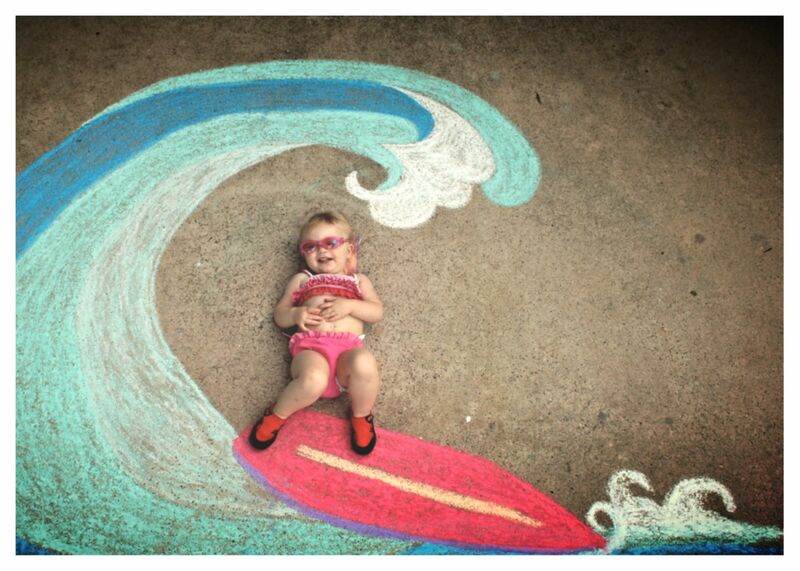 I was just thinking of ways to make playing with chalk on our driveway more inviting for our kids. And those tools–those are awesome! So many awesome ideas here! We LOVE our sidewalk chalk! BRB.… going to do all the chalk things outside! These are some awesome ideas!!! Some amazing ideas here! Thanks for sharing! This is a great post! I have bookmarked it, and will share on Pinterest. I love that there are ideas that little and big kids can do! Shauna with Walkie Chalk here! Thank you for including us (again)! Your list amazing and thank you for supporting our small business! Epic article. I really like the Rock Letter ideas. This would keep my kids busy for a while. 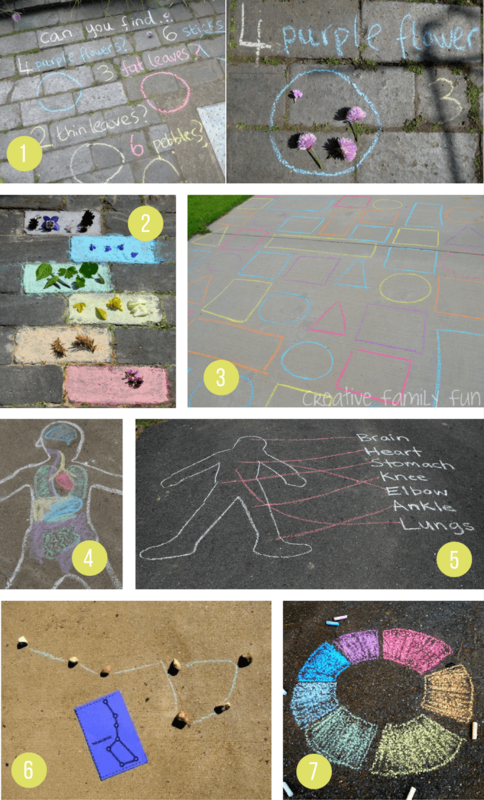 I would love to use some of these photos in a post to educators to share how they can have teachable moments with chalk activities. Is there a way to communicate with you about that? Hi Angela — sure, if you send an email to aly@whatmomslove.com I can help!